A great intro to surf perching by Alex Vlasco. 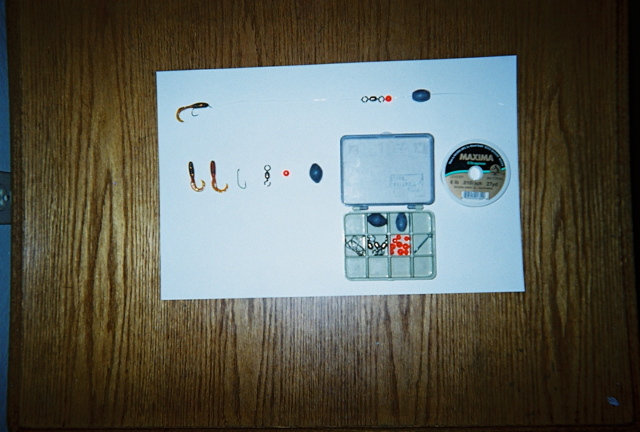 Covers the basic tackle and techniques needed to fight and land these great wintertime sportfish. Growing up near the beaches of the Monterey Bay the sea shore was my play ground. My dad and grandpa used to take me along with them when they went fishing off the beach. I could remember seeing all the fisherman and their long, long fishing poles and their sand spikes all lined-up on the beach. 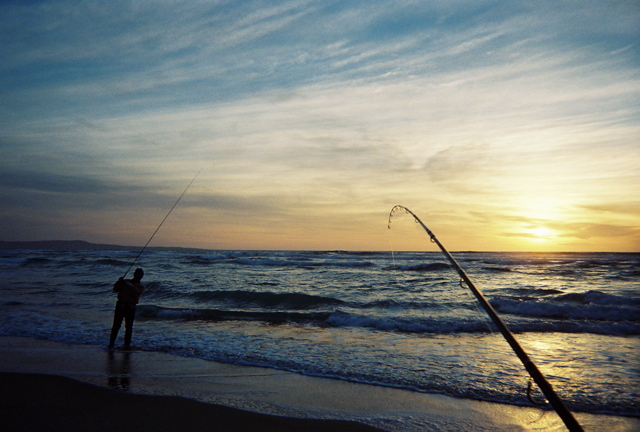 As dad and grandpa would set up their poles I would run up and down the beach looking into the buckets of all the other fishermen. I would always be so excited to see all the big fish (Bard Perch) that have been caught. 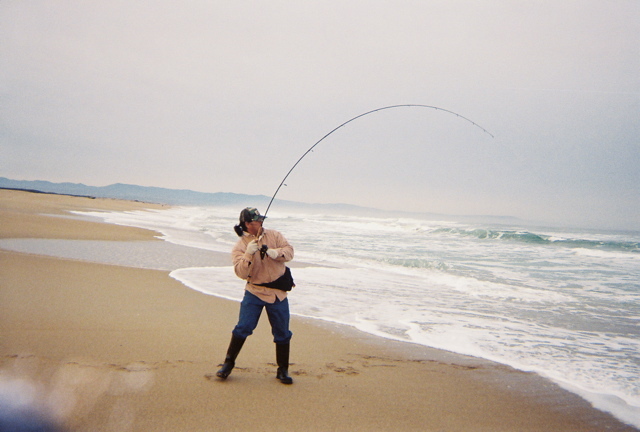 When I was big enough to handle a twelve foot surf rod, my dad had bought me my first set-up. From that point on I was walking just a little over a mile to the beach every chance I had. Learning some thing new each time either on my own or from a fellow fisherman. The set-up was a 12 foot rod with a Mitchell spinning reel loaded up with 25lbs. monofilament line, store bought surf leaders, you know the kind with the swivel on top and the snap swivel on the bottom with two loops to attach the Snell hooks in-between, a 3oz. pyramid weight, and sand crabs for bait. I would Cast out as far as I could and put the rod in the sand spike and wait for a fish to bite. Several years has passed and a lot learned I occasionally still use that set-up. 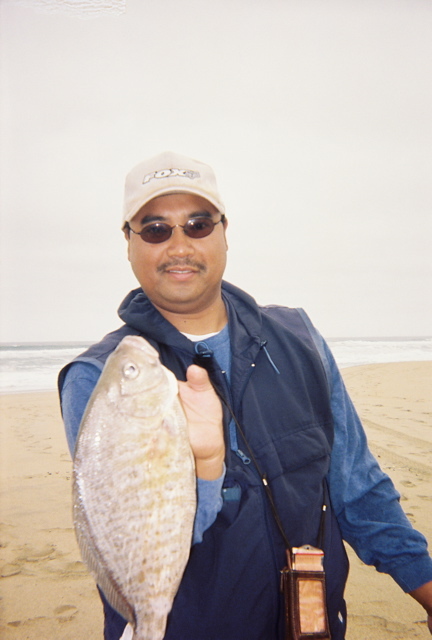 These days, to be more productive, I've changed my gear and technique and use my experience to catch more surf perch. A sliding eggs sinker, orange 3mm bead to protect the knot, a large barrel swivel, 8lbs. Maxima Ultragreen leader and a #8 bronze Gamakatsu bait-holder hook. Leader is almost the length of my pole during incoming tide and shorter during low tide. I always walk along the beach till I find a sandbar where the surge is breaking and the backwash is dropping into the edge of the sandbar. This is where the perch are usually feeding on all the crustacean that are being washed out. Rips can also be productive as well. Cast out as close to the edge of the sand bar, keeping a tight line and let the surge take your bait into the hole and hold on to your rod. If there's fish feeding there you will hook into them. 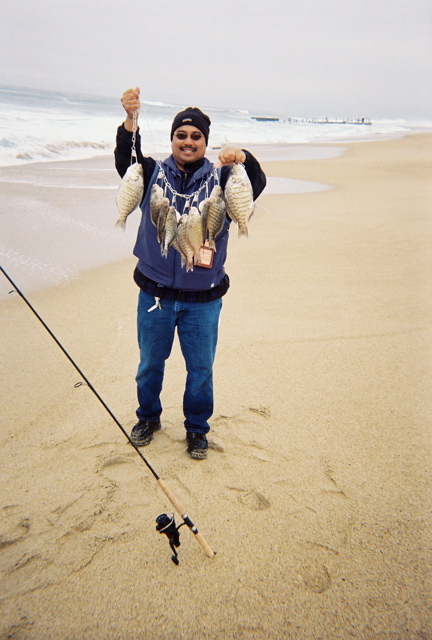 All though you could catch Bard Perch all year round, my favorite months to fish for them is February through April and September through October. These are the month I've caught the monster three pounders in the past. Good luck and good fishing.